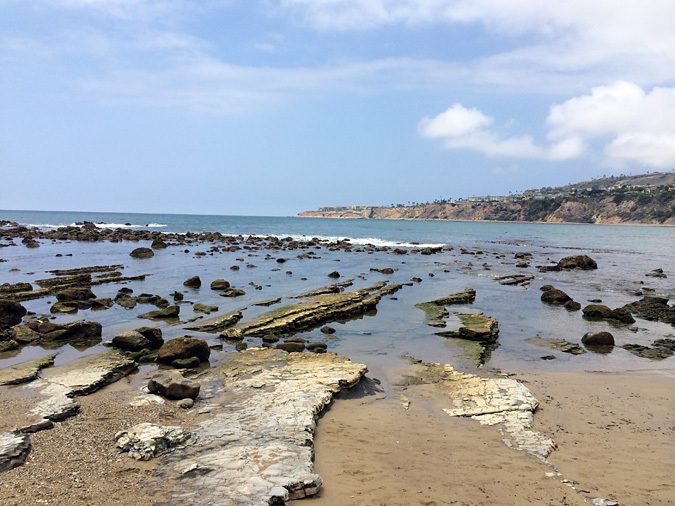 Abalone Cove Shoreline Park Tide Pools, Rancho Palos Verdes | Day Trips L.A.
Abalone Cove Shoreline Park is one of the best spots near Los Angeles to explore tide pools and discover Southern California marine life. 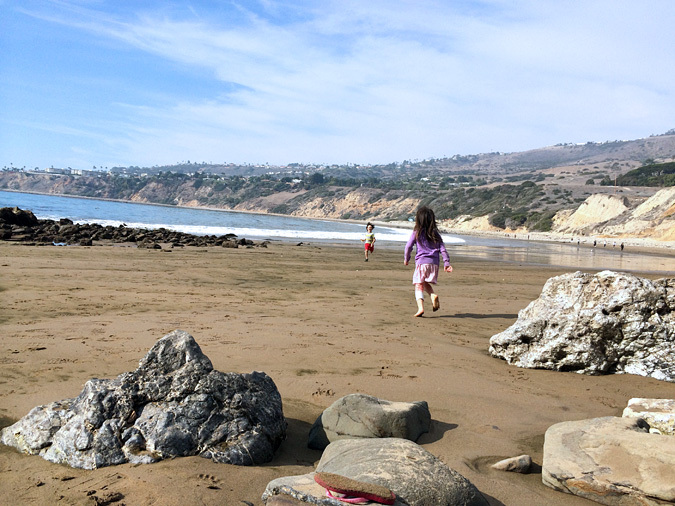 The kids and I have visited the Abalone Cove tide pools more times than I can remember. I’ve led friends, small groups of kids, and entire elementary school classes on field trips to the cove. And it never gets old. It’s easily accessible, and is in great shape despite the visitor traffic. There are always new and interesting things to find. If you’re going to spend a day at the beach, spend it actually doing something rather than laying in the sand baking in the sun. Abalone Cove Shoreline Park vista from the parking lot. Catalina Island on the horizon. 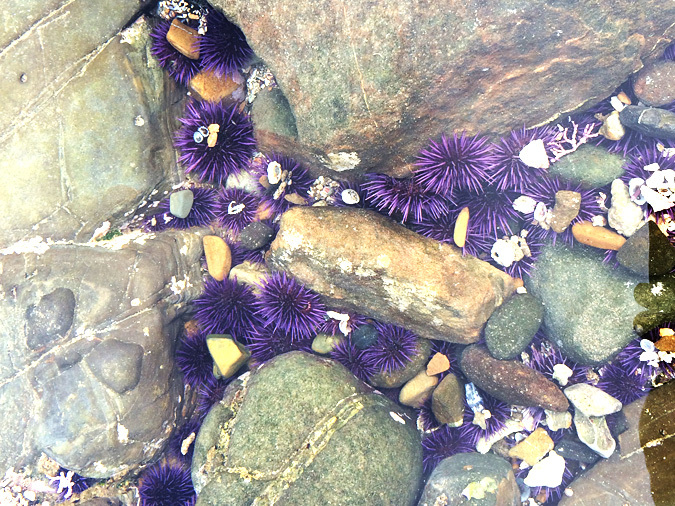 The tide pools are down the beach on the rocky Portuguese Point. 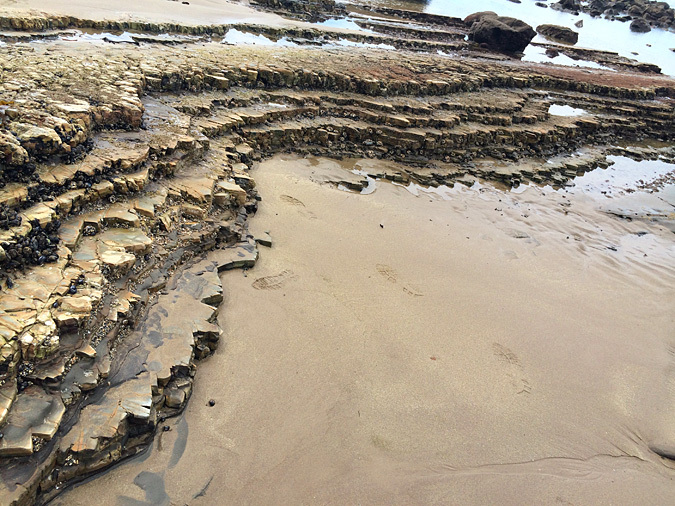 The most important thing about this day trip is that there are only tide pools at low tide. You can’t just decide to go on whatever day at whatever time you want. You have to check the tide. There aren’t great low tides at a good time of day everyday. In fact it might weeks before there’s a good low tide on a weekend afternoon. The most drastic tides, called king tides, occur during the winter months. There are many tide charts online, but I prefer to use an iPhone app because it knowns my location. The best tide chart app is TideGraphPro for the iPhone. Or check online – NOAA tide chart. Or just leave me a comment, and I’ll do the research for you. 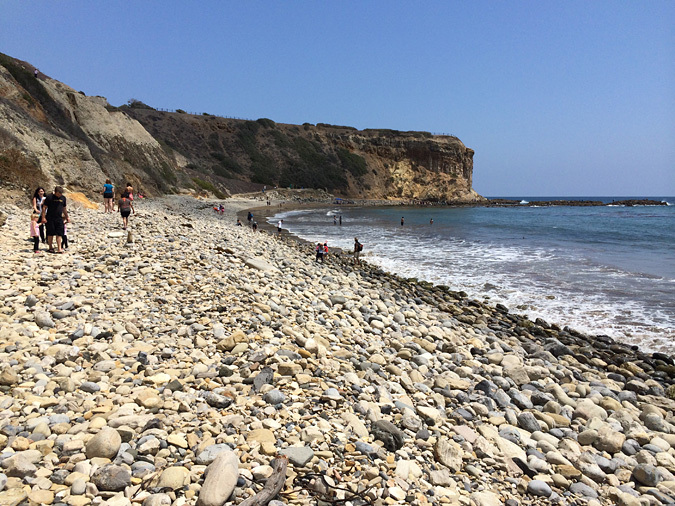 The Abalone Cove tide pools are part of the Abalone Cove Ecological Reserve, a 64-acre reserve featuring great views, a number of short trails, two beaches, and important natural marine resources. 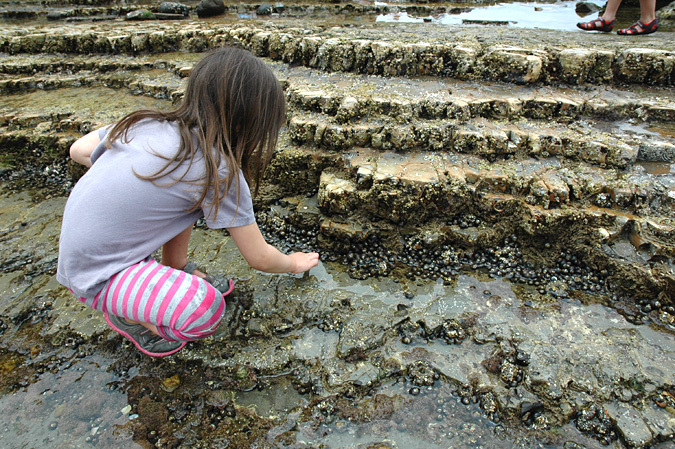 The tide pools are located at the base of Portuguese Point, the most prominent feature in the reserve. From the parking lot, as you are facing the ocean, exit the lot at the far left corner, and continue on the Abalone Cove beach trail all the way down to the beach. About halfway down the trail, you’ll encounter a paved road. Walk to the left, until you see where the dirt trail picks up again. 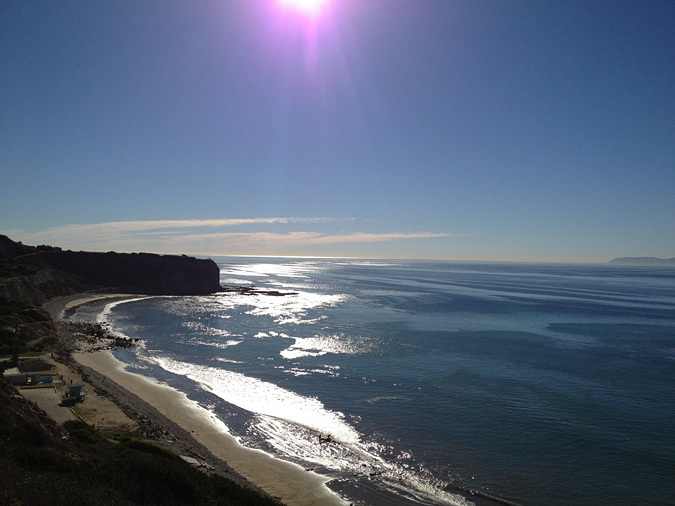 The trail ends in a small ravine, and then you’ll continue along the rocky beach to the point. 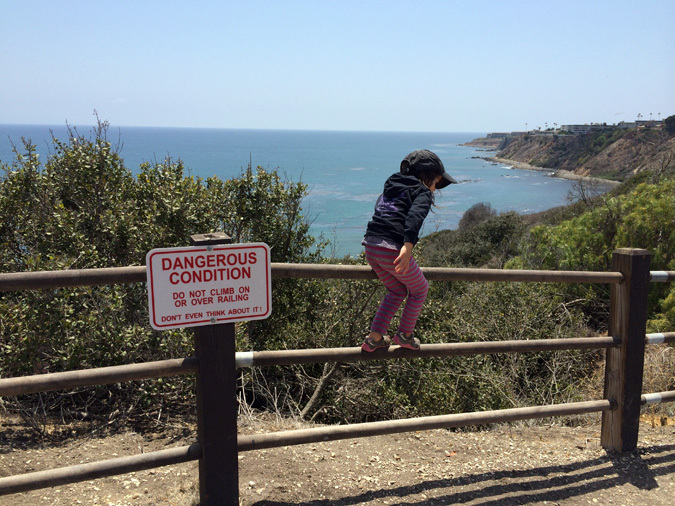 Avoid the Dahlia Trail that goes along the top of the bluff. 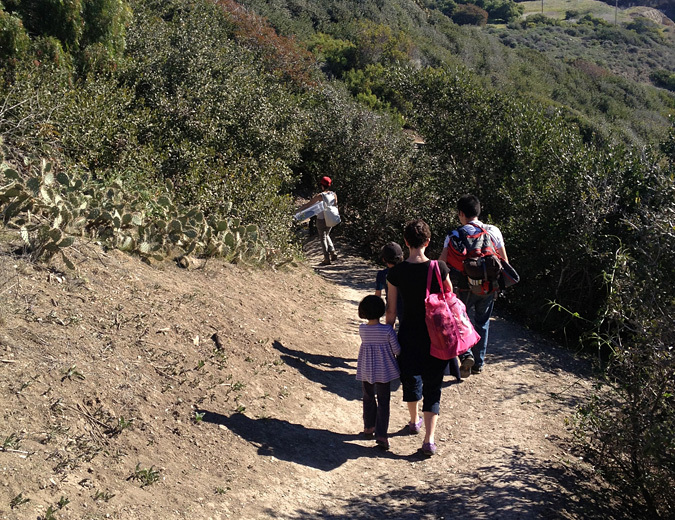 It is sketchy, and not a trail on which you want little kids hiking. Picnic lunch and the usual beach stuff. We usually eat down at the beach, but there are picnic tables up by the parking lot too. I recommend bringing a small bucket or plastic bin, like a tupperware thing, to use to keep critters for a short time. It gives kids the chance to really sit and watch them, without holding them in their hand, which is not good for the animals. Abalone Cove tide pools collection bin. 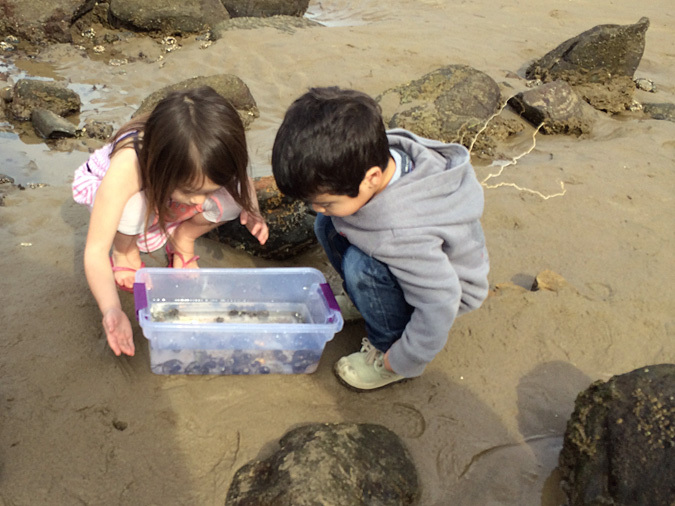 Bring a small collection bin or bucket to hold critters for a short time so kids can observe them. 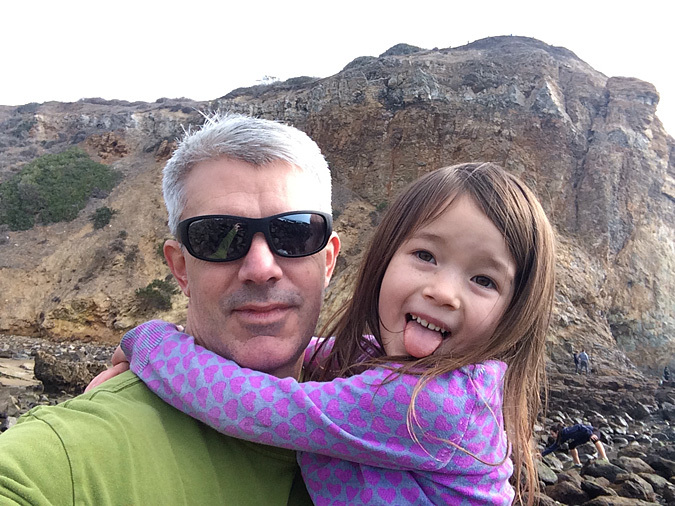 My kids always make new friends at the tide pools. The trail is well-maintained and the bathrooms up in the parking lot are fine. What you’ll discover depends a bit on the time of the year. 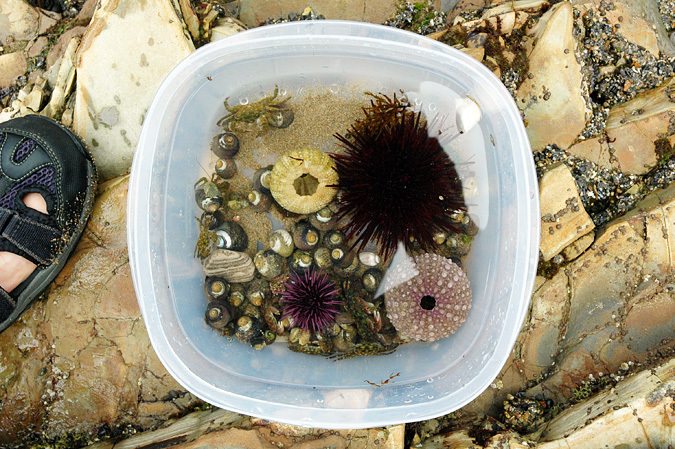 The cove is a classic Southern California tide pool inhabited by fat slimy sea hares, a few types of urchins, sea stars and brittle stars, crabs, snails and other mollusks, lots of small fish, several species of small crabs and shrimp, and zillions of hermit crabs. And if you’re lucky and look hard, a few small octopi. 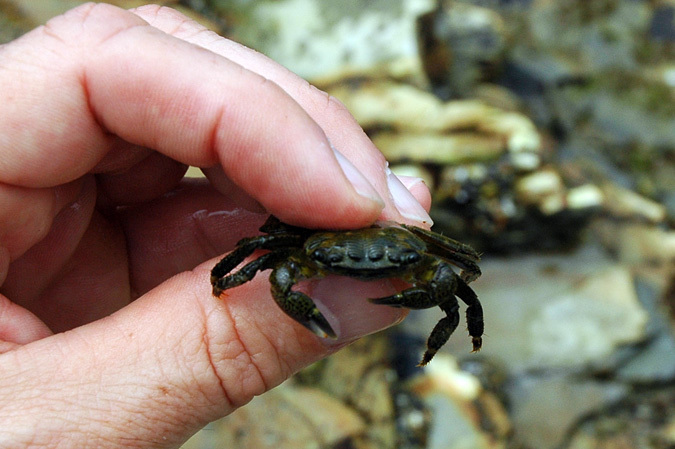 Many of these critter live under the flat rocks and in cracks in the rock layers. It’s ok to gently turn over rocks to look for animals but you must replace the rocks exactly as you find them. Many sea creature are stuck the underside of these rocks, and if not replaced correctly, those animals may not live. There are also a few sea birds around, and often fishermen out on the rocky point that may have a few fish to look at. The guy who mans the parking lot gate can give you a photocopied animal identification guide that is fin to have. Kids want to know the names of the things they find. Abalone Cove tide pool sea hare. 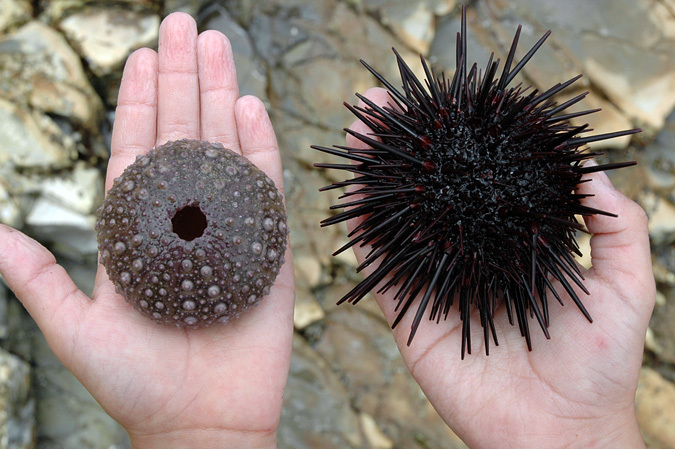 If you pick them up, plan to have your hands stained by purple ink. 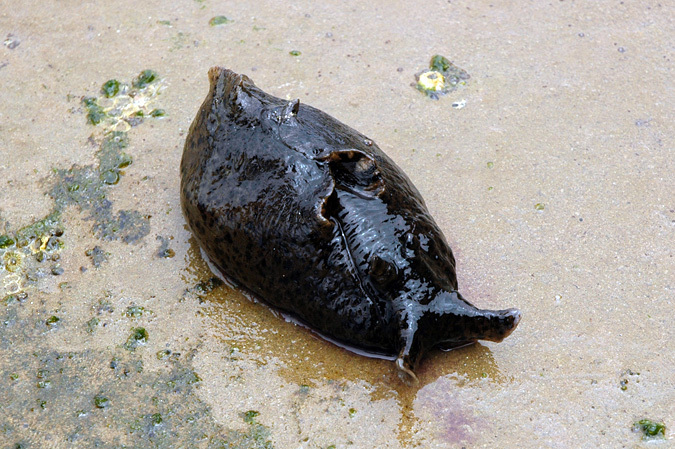 You do not need to “rescue” sea hares that seem stranded at low tide. 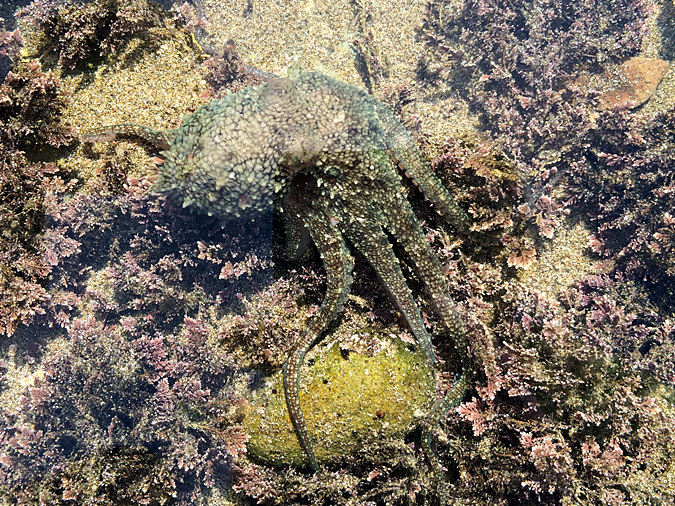 Abalone Cove tide pools octopus. 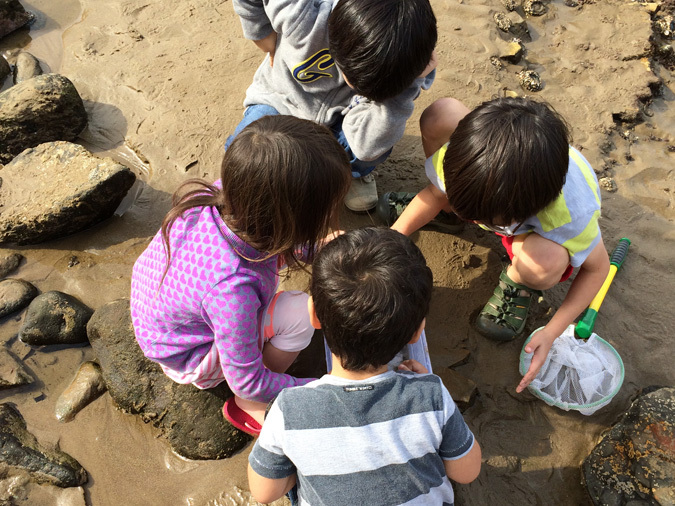 During a field trip in March, we found five small octopi. 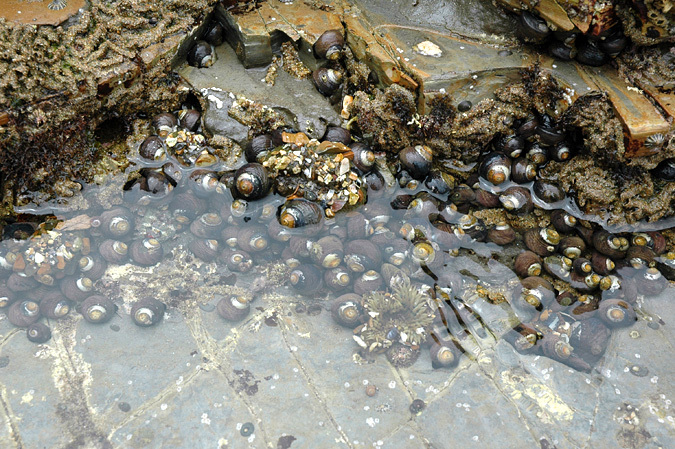 Abalone Cove tide pools crabs are everywhere. 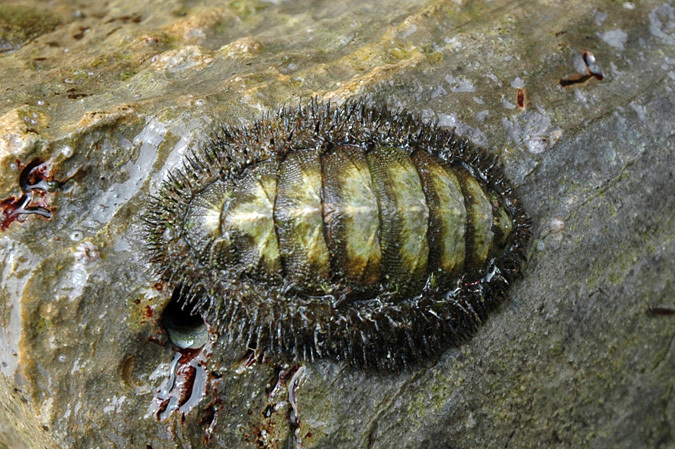 Abalone Cove tide pools chiton. 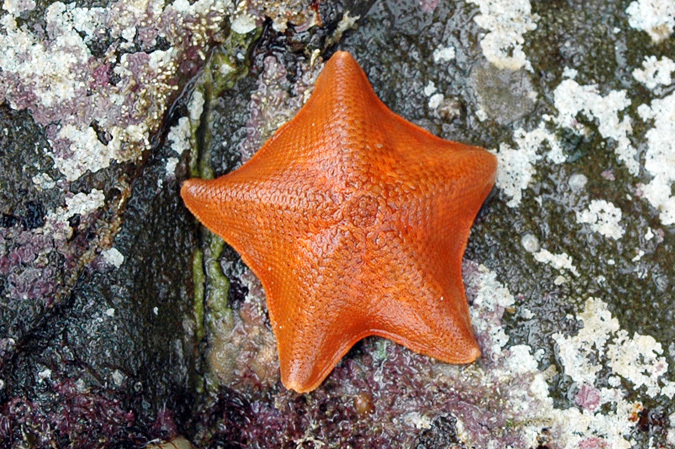 Animals like this are stuck firmly to the rocks. Do not try to peel them off. Abalone Cove tide pools bat star. It’s ok to turn small over to look for animals underneath, but make sure to replace the rocks as you found them, or the animals and algae secured to the underside might die. 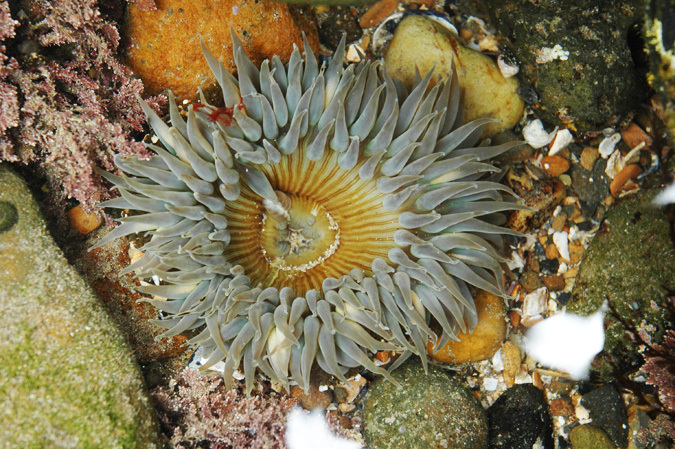 Abalone Cove tide pools anemone. We always bring our lunch, and never stop on the way there or home to eat in Palos Verdes or Long Beach. If you know of a good place, let me know. 110 S to San Pedro. Go until the freeway ends, turn right on 1st, then left on Western, then right on Palos Verdes Drive. You’re getting close after you pass the Trump golf course. You’ll pass the parking lot (on the ocean side), and do a legal U-turn to get to the other side of the road. If you’re coming south on Palos Verdes Drive, just turn right into the lot. It’s $5 for parking. 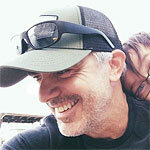 I’m a single dad, father of two amazing kids, living in Pasadena, CA. Doing my best to explore the outdoors with my children, and to be an inspiration to others to do the same. Follow me on Instagram to see our latest adventures. I'm a single dad, father of two amazing kids, living in Pasadena, CA. Doing my best to explore the outdoors with my children, and to be an inspiration to others to do the same. Follow me on Instagram to see our latest adventures. This is so informative! I sincerely appreciate the great detail. We are visiting LA over Thanksgiving and a road trip like this sounds perfect. But I am concerned… how do I know if it’s a good time to go? Is this a good time of year? We are from MO and have no idea how to go about planning beach visits in the fall. I tried calling and no one answsered. I don’t feel comfortable calling the Ranger hotline… Thank you for whatver you can offer. Hi Katie. Shoot me an email at daytripsla gmail, and I’ll give you some details.